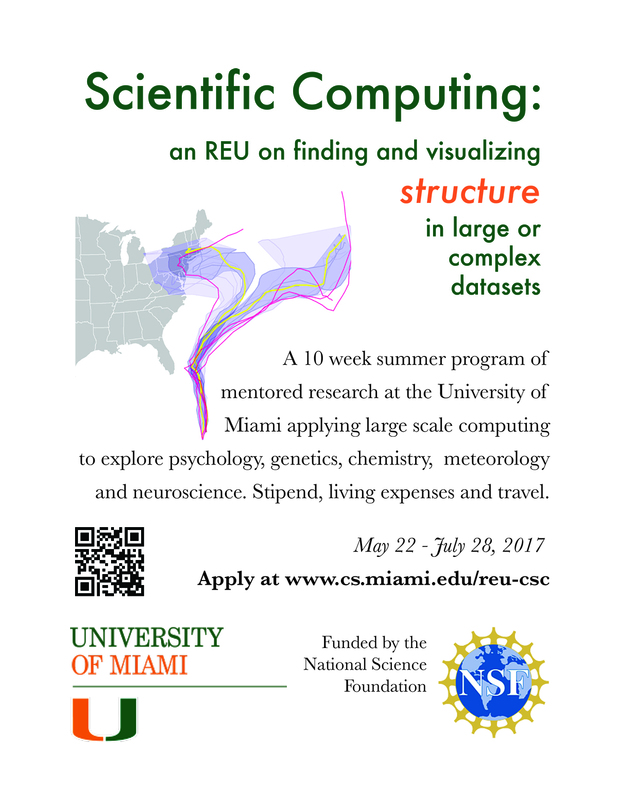 The Department for Computer Science, in partnership with CCS and other UM units, is accepting applications for the National Science Foundation Research Experiences for Undergraduates (NSF REU) summer research experience. This 10-week program runs from May 22 – July 28 and focuses on the discovery and visualization of structure in large datasets. Students can familiarize themselves with the NSF REU by visiting the NSF REU Information For Students. Applicants must be US citizens or permanent residents. Applications must be submitted via email to Dr. Burt Rosenberg at burt@cs.miami.edu. Click here for full program details and instructions on how to apply.